I’m going to start this post by saying…I love Sophie Kinsella. I love all her novels, and when I found out that she has more novels, under her real name, Madeline Wickham, I literally was jumping in the bookstore…literally. However, right now I’m going to write about her newest novel, Wedding Night. First of all, I didn’t know that she had a book coming out. I walked into the bookstore and saw this from a distance. I beelined straight to it. I’m so glad I bought it, I thought it was absolutely adorable. The book centers around 2 sisters: Fliss and Lottie. Fliss is going through a rough divorce and Lottie believes that she found her one true love, Richard. However, Lottie thinks Richard is proposing and needless to say things get awkward. So how does Lottie cope? She finds her first love, Ben who she hasn’t seen in 15 years and decides to marry him! What!?! Yeah, things get crazy. I think that’s enough to wet your appetite 🙂 . 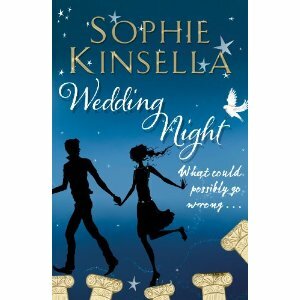 Kinsella does a wonderful job at writing these fun, flirty, hilarious novels. It’s compelling, and believe me craziness ensues. I had moments of laughter within this book and moments of intense worry. You know those feelings. When you actually have to stop reading because you are so embarrassed for the character. It’s a wonderful, romantic story and I would recommend it to anyone! Next Post I’m Running A Half-Marathon!?! I read this in less than a week! Loved it too! Her Madeline Wickham books are not as quirky or funny as her Kinsella books, I’ve found. It’s amazing thinking of just how she comes up with these stories! Yeah she is awesome at creating these stories. I also have noticed that her Madeline Wickham books are more serious too.